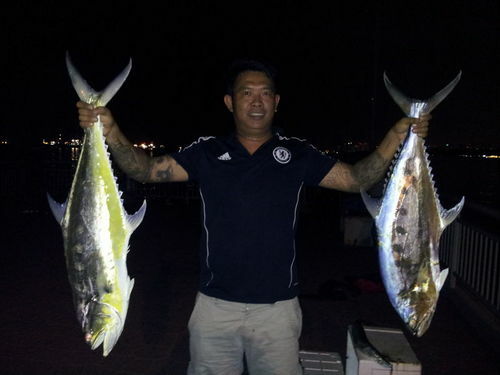 We started out jigging tamban for bait before dark….then we setup our tackles….Not long after that….Ah Boi got his first fish on a cable car rig….A 5kg queenie take his live bait and let his reel go screaming….I was beside it and I took the rod and strike…the fish make two acrobatic jump on the water surface and was bring in by Ah Boi himself after I pass the rod back to him. I gaff it up. 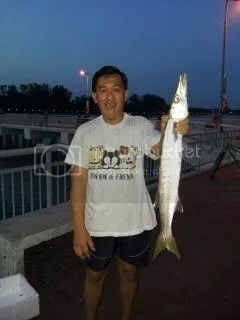 Next was Ah Fei…his reel screech when the tide start to turn up….We initally thought it caught a floating rubbish…until we saw something jumping out of water far away…Fei wind back a 1kg plus barracuda….he use his rod to lift it up. Not long after….Ah Fei reel start to sceam again…..It turn out a small marine catfish around a kg. Again he use his rod to lift it up. 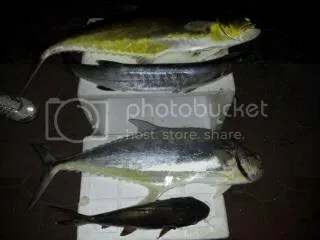 Then…later in the night….ah Boi move his rod to another spot…and he got his jackpot…His reel scream again….The fish again make a acobatic jump far away…..but ah Boi bring it in….it turn out to another queenfish…I gaff it up…it weigh slightly lighter….4.75kg.